We have to write this code in Bean shell. Apache Ant is a Java library and command-line tool whose mission is to drive processes described in build files as targets and extension points dependent upon each other. The main known usage of Ant is the build of Java applications. Ant supplies a number of built-in tasks allowing to compile, assemble, test and run Java applications. Ant is very flexible to use .It converts the JTl to HTML format . 1) Ensure that the JAVA_HOME environment variable is set to the folder where your JDK is installed. 3) Unzip the zip file to a convenient location c:\folder. using Winzip, winRAR, 7-zip or similar tools. 4) Create a new environment variable called ANT_HOME that points to the Ant installation folder, in this case c:\apache-ant-1.8.2-binfolder. 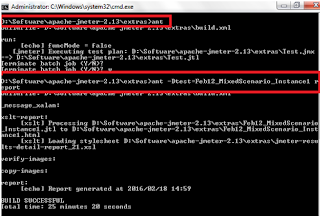 6) Now to check environmental Variable is set on cmd check Java –version and ant –version. 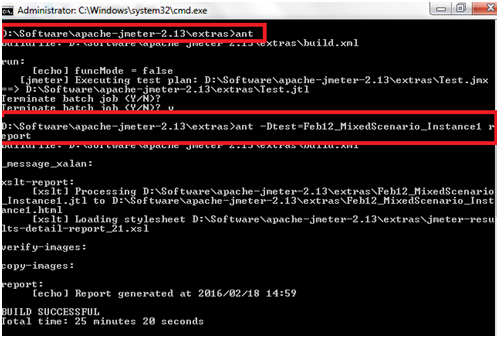 7) On cmd browse to extras in jmeter (cd D:\Software\apache-jmeter-2.13\extras) and set heap size . 9) In continuation without closing the java program press Ctrl+C and terminate batch job . 10) Then enter in cmd line > ant –Dtest =<Filename> report then press enter. 1) Total no. of success rate ,failures rate and the response time. 2) Response time of each and every transaction. 4) Failure detail corresponding to the transaction.